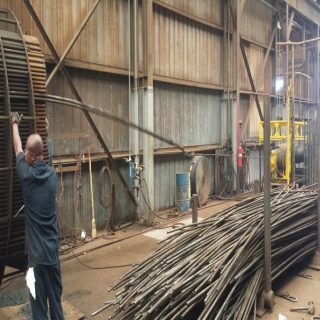 Strip and Retube - Metalforms, Ltd.
One of the most important and time sensitive services that we provide to our clients is strip and retube of existing heat exchangers. We can strip an d retube all TEMA types of shell and tube heat exchangers and can also strip and retube air coolers. Once a unit arrives in our shop, it will be rapidly disassembled, inspected and retubed in order to get our clients back up and running as quickly as possible. Metalforms has the capability and expertise to handle multiple strip and retube jobs simultaneously and our ability to work 24/7 ensures our client’s delivery needs will be met every time. On fixed tubesheet exchangers we completely disassemble the unit, abrasive blast the inside of the shell and baffle assembly and perform a thorough inspection of all parts. Our quality control inspectors will work with our clients and advise of any additional damage that may require repairs. The discovery of these unforeseen issues can save our clients significant time and money while preventing unplanned downtime in the future.